Open Panel On Compile is the result of an improvement suggestion. When this option is selected the FDTracer panel will always be displayed after a compile completes. Colour Warnings and Errors adds some colour to the trace statements. 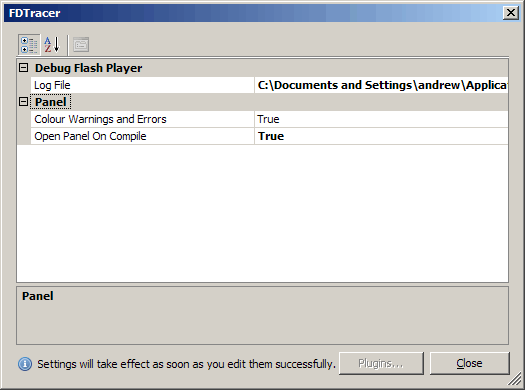 Warnings and errors generated by the Flash Player appear in orange and red fonts respectively. Argh. I used version 0.2 all week before posting it last night and then this afternoon I came across a bug that was dropping digits that begin a trace statement (eg, trace(”1,2,3″); would display as “,2,3“). Version 0.3 should fix that silliness.